Last year I included costumes inspired by famous Marvel and DC super heroes. Now I want to revisit some classic 80s cartoons. My 5$+ Patreon Supporters helped me decide which ones to pick and the first update will focus on one of their favorites: He-Man and the Masters of the Universe! 12 new items were included today, inspired by three beloved characters of this franchise. The next update will be about a different 80s cartoon. I hope you enjoy the new items! Some of them are very nostalgic, like the Skeletor mask. But others can be useful for different types of characters. To celebrate my Patreon launch I drew new costumes for your SP-Studio characters! Many people ask me to include more clothes to dress up your avatars as fantasy characters, like shiny armor and classy gowns. Since HBO’s “Game of Thrones” just launched its fifth season and I am a big fan I decided to dedicate this update to the show. So these new costumes are inspired by the fashion of Westeros. I hope you like how they turned out. I wanted to draw something which is not only interesting for fans but also neutral enough to use it for any kind of medieval or fantasy characters. There are 5 new shirts, 2 dresses and a single belt. If you like this update and want to see more like this in the future please consider supporting the SP-Studio at Patreon or sharing this link. I want to dedicate a whole month of SP-Studio updates to animals, so let’s start with a very popular species: The pony! I included 11 new items inspired by the cartoon My Little Pony: Friendship Is Magic, developed by Lauren Faust. Hooves as hands, a pony nose, a unicorn horn, wings and pony ears. 2 tails and 4 hairstyles inspired by main characters of the show. And as a special bonus: A wallpaper! I hope this little tribute is a nice addition for all bronies out there and will be useful for other types of animal characters as well. I designed the hair so you can even use it for human characters. You might wonder why there are no unique details like the cutie marks or colorful highlights in the hair. This is because I did not want to just copy one existing pony but rather find interesting parts for creative use. Special thanks to Twilight Sparkle, Fluttershy, Rarity and Pinkie Pie who posed as models :). A new update is online, inspired by BBC’s DOCTOR WHO! After drawing Sherlock I wanted to do something related to another popular British tv show. Many fans asked me for a Doctor Who costume, but it was difficult to pick a doctor. Everybody seems to have another favorite. So I decided to do all the three “new” doctors in one update. Three hairstyles and two suits were added and I hope everybody is happy with this :). What’s the best thing that happened this year so far? New episodes of BBC’s SHERLOCK! I felt like Benedict Cumberbatch as Sherlock Holmes was a good inspiration for a SP-Studio update. Not only because he is very popular, but also because you can use those items to build other characters as well. So I hope you like the five new parts, even if you are no fan of the show. Many of those items have mutiple colors and I hope they are useful for you. I picked things which can be used in many ways (that’s why there is no Darth Vader mask, it would be boring ;)). Most of them are based on your wishes. So that’s it – the SP-Studio Hollywood Weeks are over! 50 new items. Now I will take a little break. But if you still need more movie stuff join the SP-Studio community. Voting for the current contest “Sci-Fi movies” starts tonight. And of course I am looking forward to your feedback. Did you like the movie related updates? Disney’s animated movies are special, especially the old classics. So I decided to focus this movie related update on some of their famous characters. 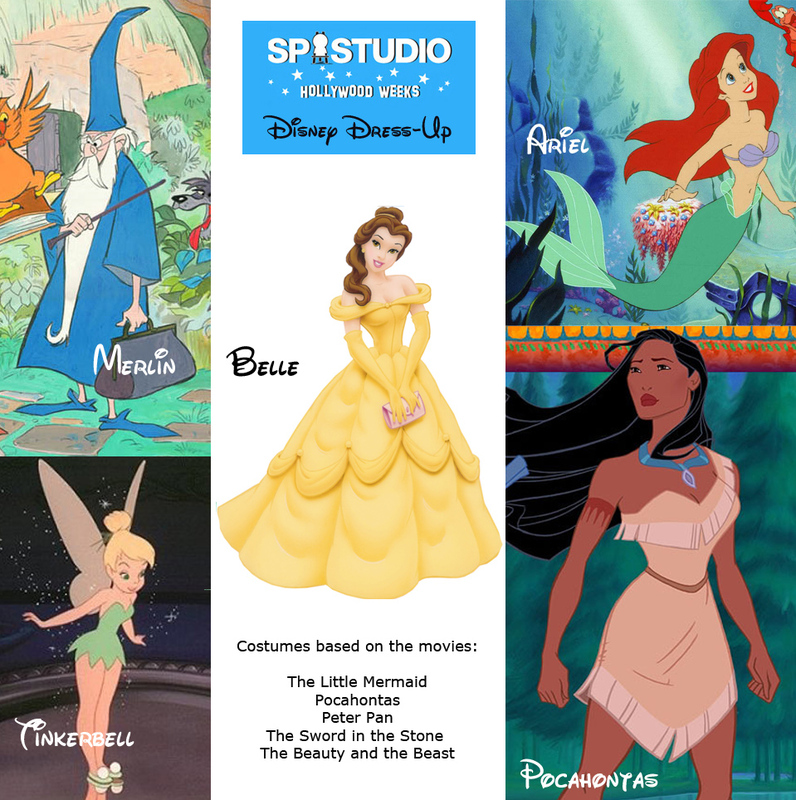 I picked Belle, Merlin, Tinkerbell, Ariel and Pocahontas, because parts of them could be intersting additions to the SP-Studio. This time it’s not only clothes – there are even tattoos, jewelry, beards and fairy wings, 13 new items!. You can see all of them in the picture below and they are marked with a star in the SP-Studio. Those characters are from the Disney movies The Little Mermaid, Pocahontas, Peter Pan, The Sword in the Stone and The Beauty and the Beast. My reference pictures. Copyrights for them belong to Disney, I just do fan art. I hope you like the new items! And remember there will be even more soon, my Hollywood Weeks are not over yet :). So you can still make suggestions on movie related updates. The SP-STUDIO HOLLYWOOD WEEKS continue with a 2nd movie connected update. Here is a reference picture. I tried to pick something for everybody: From Jack Sparrow to Tyler Durden, from classic to new. There will be more movie outfits soon, so THIS is your chance to tell me which costumes you would like to see in the SP-Studio. Write an E-Mail or suggest them in the comments. Update: 40 new hair-styles… and more! As promised I drew some hair for you… and I got a bit over the top. I planned to draw about 30, but now there are 40 new hair-styles. I hope you like them! I listened to your requests and so there are some emo, scene girl, anime and even Simpsons hair-styles. And there is another surprise! I got many questions about adding highlights to the hair, so I included this now. You can use the “customizable highlights” category to add them to the existing hair styles. You can move and flip them or combine different highlights to create your individual style. Including this was very complicated, so there is only one page of highlights right now to test if you like it. And of course they do not fit with every hair cut – it is up to you to be creative and combine them in a good looking way. But I tried it out and there are countless possibilities for interesting new hair styles now. So enjoy it! :) I did not forget about the beards, but I needed so much time to draw the hair-styles, that I will add the beards later (around February 24th).